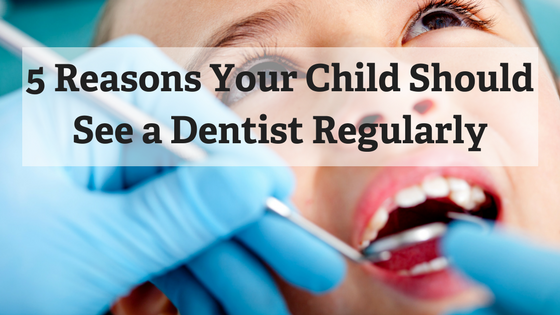 Here are 5 reasons your child should regularly see a dentist. Cavities do more damage than you think. Catching cavities early, while they are on the small side and easy to treat, saves you time and money and saves your child unnecessary pain. In children, cavities can form in as little as a few weeks because baby teeth are thinner than adult teeth. This means an untreated cavity can quickly reach the tooth’s nerve causing more damage and pain. Children with untreated cavities will likely have bad breath, can have poor weight gain and malnutrition to due pain while eating, and may develop an infection resulting in preventable medical visits, antibiotic prescriptions, pain and missed school. An astonishing 33% of children with toothaches suffer from sleep deprivation affecting their behavior, appetite, and ability to pay attention in school. On top of all that, premature loss of a baby tooth can result in speech impediments, loss of space for permanent teeth and malformation of the bite that could shift the shape of the entire jaw and face. Smiling affects confidence and self-esteem. Every parent wants their child(ren) to be physically and emotionally healthy. As mentioned above, premature loss of a baby tooth can result in speech impediments and a potentially less than esthetic smile. This can be a source of teasing or bullying. When a child doesn’t like his/her smile, self-esteem suffers. Smiling makes us more attractive, relieves stress, and shows confidence that helps lead to personal and professional successes throughout life. It is necessary to monitor that the teeth (baby and adult) are coming in properly. Unfortunately, a lot of things can go wrong when baby teeth fall out and adult teeth come in. Baby teeth act as placeholders for adult teeth, helping them to grow in straight. When baby teeth fall out too early or adult teeth come in too soon, the result can be a crooked, crowded smile. Treating these sorts of problems early can provide the cheapest, fastest, and best results. Education on home care is important for prevention. When kids visit the dentist, they don’t just get a cleaning and exam. They get an education (Mom and Dad may learn a thing or two as well). Dentists and hygienists can be wonderful teachers, showing your child good brushing technique and encouraging them to take care of their teeth. They also know a lot of tips and tricks for healthy snacking, proper sports protection, and easing anxiety around losing baby teeth. Establishing a dental home provides the backbone for lifelong oral health. At first, a dental office might seem like a frightening place to a small child. With regular check-ups, kids will start to feel more comfortable with the idea of visiting the dentist. An estimated 30-40 million Americans have dental phobia and 36% of people don’t visit the dentist regularly because of fear (one that was usually established during childhood). Many parents don’t realize that dental care has dramatically changed since they were kids. Your children may never have to know that feeling of dreading the dentist, especially if most of their visits can be preventative in nature. In fact, they may even beg you for a visit. Many parents are surprised when they discover the American Academy of Pediatric Dentistry recommends that children have their first dental exam by age one or within 6 months of the first tooth erupting. Years ago, the standard recommendation was to take a child to the dentist at age 3. With the increased incidence of tooth decay in infants and toddlers, the recommendation today focuses on early detection and intervention. If your child has never been to the dentist or it has been too long since their last visit, please consider scheduling a visit with us today and keep your child smiling!